For years, the Wienermobile has been an icon. It drove across our nation’s highways and byways, bringing the treasure of tasty processed meat product in a handy tube to one and all. This summer, Oscar Mayer is revamping their product line and releasing new and improved hot dogs. 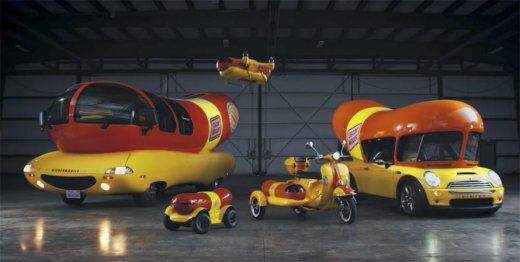 However, since they know that there’s no way to improve on the perfection that is the Wienermobile, they opted to just make it some cool friends. So, joining the “Wienerfleet” are the new ,Wienermini, Wienerrover, Wienercycle, and the flying Wienerdrone.